To paint smiles or not to paint smiles: Where do you stand? The historic development of photography has made it much more possible for artists to paint fleeting facial expressions, including smiles. Some top portrait artists are now painting smiles full of character. “My policy is to work from life as much as possible. In the event that one needs to work from photographs, the photographs should represent life. When taking photographs, I place the subject in a pose that they could hold for 40 hours if they had to. Some people I paint with a pleasant smile. But the photographic “Say cheese” smile is actually a fairly recent phenomena. You want to stay away from the candid shot. Something that obviously came from a camera. A lively debate over portrait smiles and teeth has taken place on the online Portrait Artist Forum, marshalling the best arguments on each side. It’s very worthwhile reading through this thread because whichever type of portraits we paint, we can learn something from “the other side” to apply to our own work. For example, Alexandra Tyng feels that wide, toothy smiles often appear static, while other artists note that smiles distort some facial features, e. g. making the eyes smaller. On the one hand, I personally feel that the “distortions” caused by smiles, looked at from another perspective, are actually our language of emotional communication. At the same time, the Forum discussion reminds me that however we paint, we need to be sure our subjects’ faces don’t appear static, and that their features, especially their eyes, aren’t obscured by facial expressions. were meant to convey a transitory moment. I was studying Rubens’ Saint George and the Dragon the other day, which I have attached as one example. I wouldn’t avoid painting smiles simply because people can’t hold one for thirty hours. The model for Saint George didn’t hold his arm in the air for thirty hours either. No one can sustain a natural-looking closed mouth smile for very long either; it ends up looking forced and stiff…. The same argument … could be applied to many classical paintings, including Degas’ ballet series…; no one maintains a ballet stance that long either. Brueghel … attempted to capture complex activities … as though they were frozen in time. Eakins has a woman with her mouth open in song and a man in mid-leap at a swimming hole. And there are those classic paintings of ships on roiling seas, yet waves can’t hold a pose. 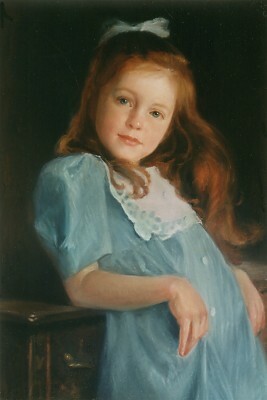 Other Forum artists point out that Van Hals and even Sargent painted fleeting expressions, including smiles and teeth; examples are posted by Tyng and Mike Dodson here. Rembrandt studied and drew himself with a variety of facial expressions: fear, anger, laughter. You can see these sketches here (scroll up slightly to see the drawings). There’s no question that in the days before photography, it was extremely difficult for artists to study their subjects’ fleeting expressions, including smiles, in order to paint them. The time required to observe and capture them would have been prohibitive for many artists. It seems to me that the reason the “old masters” painted more subdued expressions (no teeth) is because they didn’t have photographs to work from that captured those brief flashing smiles. We think of these traditional old portraits and that’s what has created the aesthetic we often try to emulate today. So when today’s portraitists strive to emulate the look of masterpieces over a century old, their painting must appear to be created entirely from live sittings. There can be no teeth or real smiles because a broad smile is a giveaway that photos were used. I suspect that another reason portraiture in the US often tends to have a conservative esthetic is that many Americans commissioning portraits want to present themselves within an old world ethos. They are striving to establish “aristocratic” credentials in a country too young and individualistic to have a centuries-old hereditary aristocracy. One of my favorite portraits of children was created by the Canadian David Goatley. These boys’ fleeting expressions are highly specific to each child and to this moment. Generic smiles these are not. The boy on the left has a gentle warm smile above his blue sports shirt. His oldest brother nurtures the impish youngest one in an embrace. To me, the very specificity of these boys’ expressions conveys far more understanding of their characters than would a standardized slack gaze. 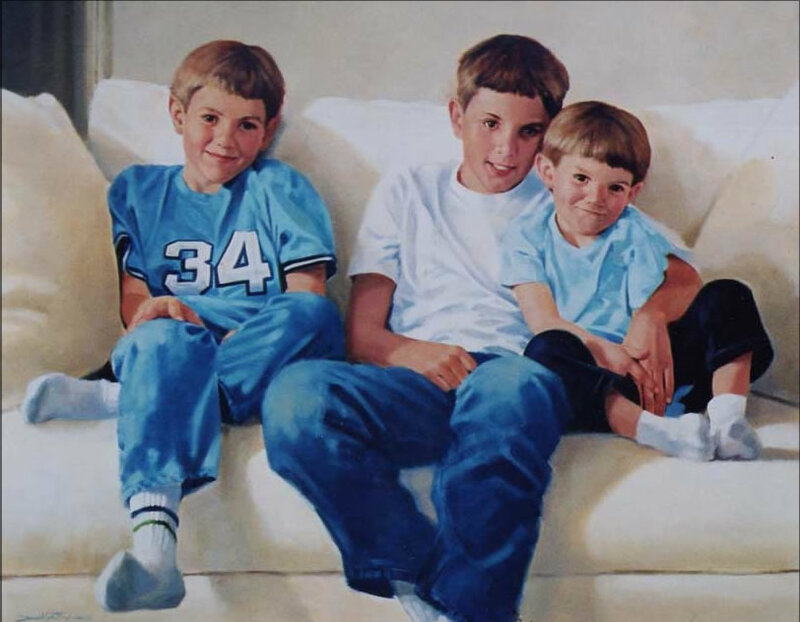 This painting gives me a rich sense not just of who these boys are now, but also of what they may become as they grow up. They are completely “at home in their skins” – a combination of masculine-sports-blue and warm caring for each other. The way these boys are painted gives me a sense that they will grow up to be – well, the kind of men I would want my daughter to marry! So for me, the decision about whether to paint a subject smiling – broadly or slightly, with or without teeth revealed – should be based not on a general rule, but on the character of that particular human being. Every good portraitist seeks to reveal character as well as superficial appearance. And I think people’s characters are visually revealed through their facial expressions more than in any other way. The smile – including the toothy grin – is part of human beings’ infinite repertoire of emotional expression, so I would never want to rule it out as appropriate in portraits. The smile is also the expression of nuance. There are more, and more subtle emotional shadings possible with a smile than with any other expression. Smiles can contain elements of other expressions like sadness or anger, creating faces of fascinating ambiguity and complexity. I happen to be a person who needs a lot of time alone to listen to and follow my own brain’s inner workings. I can happily spend three or four workdays at a stretch alone painting, researching, or writing. I wonder whether my need for aloneness during work time is part of what results in my personal preference for subjects who are engaging and connecting with other people. Conversely, I wonder whether artists and clients who need to be out and about in public more than I do prefer quieter, more contemplative subjects. After being around the hustle and bustle of life, perhaps these extroverts are looking for some quiet introspection. It would be interesting to hear from different portraitists about whether their underlying values regarding extroversion or introversion in their portraits relate in any way to their own basic temperaments. While I can find wisdom in most of the arguments in favor of unsmiling portraits, the one rationale that makes no sense to me is the idea that only an unsmiling face can withstand the test of time. I’ve never seen any evidence provided for this claim (please write a comment if you have some!). 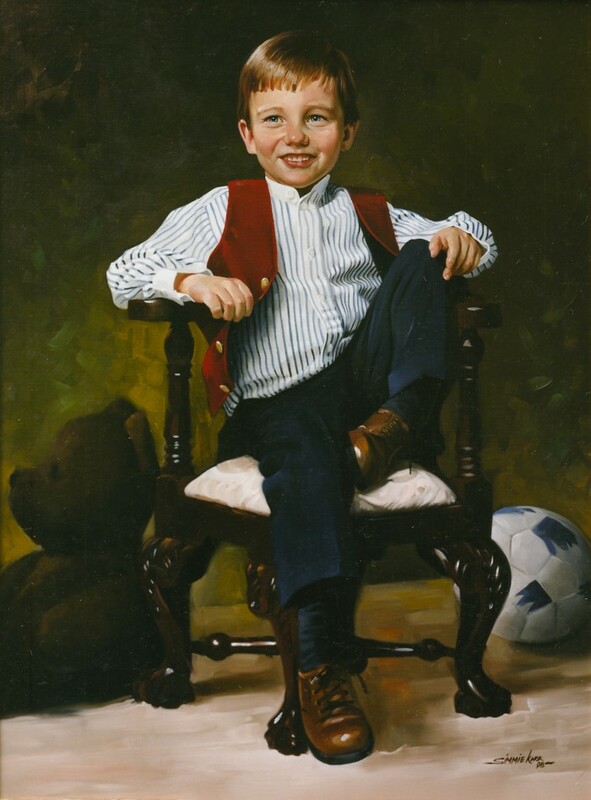 What I know is that the portraits I’ve painted of my own children all involve very characteristic smiles – toothy or subtle – that have never ceased to enchant me over the years. The two photos of my son and daughter that I would run back into a burning house to rescue each have joyous, toothy grins that capture the entire essence of their childhood in a single image. Because smiles still appear in a minority of portraits, I’ll close this post with a few more images of them (click on these images to go to the artists’ websites, where you can find more of their smiling portraits). I feel all these subjects convey a sense of warm engagement. I feel invited to interact with these very appealing people. I’d like to spend a nice chunk of my non-alone time with each of them. NOTE: Since I wrote this post a couple of years ago, a controversy has erupted over the 2012 portrait of Kate Middleton, in which she’s painted with a subtle smile. This has brought a lot of new readers to this page. I’d like to steer readers to two discussions of the topic on other websites. One is by the artist Katherine Tyrrell, on the British blog Making a Mark. The other is on the facebook page of the portraitist Sophie Ploeg. Each includes a lively discussion by portraitists such as Alexandra Tyng and others. What is art in portraits? Portrait composition: Old World vs New? What is Playground of the Autocrats? How was my Jewish grandfather living outside the Pale in Russia?